Thanks to the power of this forum and its users (Terra, P0lar, Smooth, Tap, SliM3 et al) , I've learnt a great deal about the DME in our cars. I used this information to write a PHP based website that allowed users to upload the dumps taken from their DMEs using Smooth's fantastic BMWFlash and modify them without need for any hex editing. After processing over 2500 binaries I decided that an offline version should be my next project. Q: What do I need in order to use this software? A: A partial read from your MSS52/54 ECU/DME using BMWFlash, MSSFlasher, Galletto or MPPS. Q: What cable do I need to use BMWFlash or MSSFlasher? A: Any FTDI based K-Line cable will work for this. It’s suggested that you use the FT232RL based cables, as they’re much more reliable. Q: What exactly does the software do? 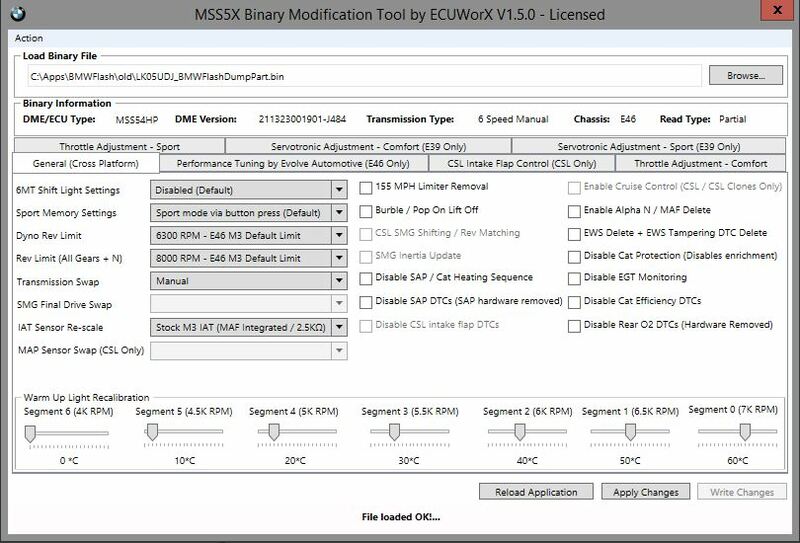 A: The software loads the 'partial read' taken from your ECU/DME and allows you to manipulate various settings without having to learn how to interpret hex or the underlying data contained within the ECU. Q: What can I do with your software? Q: Is the software safe? A: Yes, the software only makes changes to the 'parameter' space. The software does not make changes to the file you have loaded, the changes are saved out to a new file so you always have an untouched original which can be reflashed if you wish to restore back to your original parameters. Q: Can't I just make these changes manually with HexEdit or similar? Q: Does your software correct the checksums? Q. I want to try the 'burble and pop' feature. Will it wreck my cats? Q. I've applied the inertia fix along with CSL shifting / rev matching. Do I need to update my SMG DME? A. For best result, yes. Q: Will this work with my tune from 'tuner x'? A: If you're able to get a legit read from your ECU/DME that isn't encrypted or scambled then yes. However, the tool won't touch any other parameters in your tune so your tune will not be negatively effected. Q: I've purchased a license already, do I get upgrades when you update the software? A: Sure you do, just download the latest build and your license will be read automatically. Q: I want to make multiple changes to my car, do I need to purchase multiple licenses? A: Nope, a single license will allow you unlimited changes to your ECU. Q: What's with the multi-version license? A: The multi-license allows unlimited changes to any variant of the MSS52/MSS54/HP ECU, perfect for those who tune/tweak peoples ECUs for a bit of extra pocket money or for those who want to use the product commercially. Q: I've decided I don't want to use your software after purchasing it, can I have a refund? I've not used the software.....honest! A: Due to the nature of software, refunds are not possible. If for whatever reason the software doesn't work as expected, shoot me a mail, I'll help you out where I can. Are you planning on expanding the features? It would be great to have a dedicated tuning interface in-lieu of just using TunerPro. If you need any additional resources to support further development let me know..
Martyn this is epic! Great work indeed! Too bad I've now mastered my hex editing skills from modifying these tunes manually. Lol. You guys are seriously awesome. Thank you so much for this! This is going to be VERY handy for the not as hex/binary savvy people. I'll take a look into the features you guys have mentioned! I know ccfj1 (John) wanted me to add support for a SMG/Manual trans swap and a few other little bits. Bloody awesome work!!! Top man for sharing this Martyn!!!! Downloaded it to check it out... looks great! Not bad. What are your burble/pop lift off settings? Per NZ_M3's numbers? All times are GMT. The time now is 11:53:51 PM.